SUMMARY: Seeking more romance in their lives, unlikely friends Lily and Marijke scheme to makeover their relationships by recreating scenes from classic romantic comedies. IF THIS BOOK WERE FOOD, IT WOULD BE: A Strawberry Pop Tart. There's nothing nutritional or especially memorable here, but it's fun while it lasts. 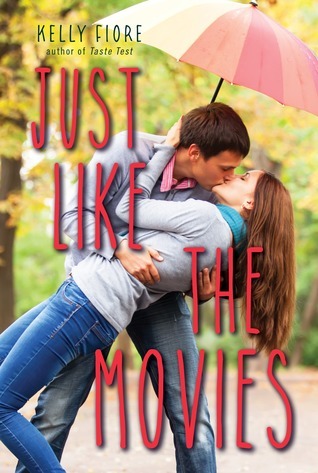 WHAT I LIKED: As its title suggests, Just Like the Movies references tons of fantastic movies from the past 30 years. Including everything from Sixteen Candles to Mean Girls to Say Anything, Just Like the Movies makes me want to snuggle down for a marathon of these and other classics. Some may say that the abundant film quotes will date this book, but I think the movies included here are already classics. Even decades later, we still love to watch them over and over. I don't think this book is intended for a long shelf-life anyway. Easy to book talk! I have no doubt that, as with Taste Test, this book will be easy to "sell" to middle school girls. Though it isn't the greatest literature ever, the cover and blurb will entice readers to give it a try. Any book that can do that is a "win" in my book! WHAT I DIDN'T LIKE: The relationships. Despite the alternating first-person viewpoints, I wasn't connected with any of the characters. After reading all 288 pages, I still don't feel like I really know Lily or Marijke. Ditto with the boys they like. Tommy seems like a typical teen boy, and we know almost nothing about Joe. I am disappointed that neither of the romances pulled me in. Could Lily's mother be more desperate for a man? I truly wanted to reach in and slap her. I was going to complain about the name Marijke until I saw that the author named her after a friend who died young. Let's just say that I never could figure out how to "say" it in my head. Every time I read it, I got stuck on the pronunciation. There is a phonetic pronunciation early in the story, but I never could get it right. Kind of like Hermione in Harry Potter--I guess sometimes, I need the audio. THE BOTTOM LINE: Overall, it's just okay for me. I won't remember it next week, but it was cute enough. Middle school girls will probably like it better than I did. Thanks for the reminder about this one. My romance readers go trhou SO many books that I am always on the lookout for MG appropriate ones. They like Taste Test, so I'll definitely check this ne out!